A glass or crystal vessel that wine is poured into for optimal aeration and sediment separation before consuming. Many believe decanting will generally allow a wine to breath, which is supposed to soften younger wines such as reds with high levels of tannins, allowing the wine to become more supple and pleasing to the taste by removing some of the hardness of the wine. Both red or white wines may have a flavor that is tannic (dry and bitter tasting) or acidic (tart and harsh tasting) that may need to be softened, which many feel can be accomplished by decanting. Similarly, decanting is believed to allow the bouquet of the wine to improve and become more complex as the aroma of the fruit is emitted and sensed by the person drinking the wine. Those who are opposed to decanting for flavor purposes feel that wine becomes flat tasting as it is decanted and the process reduces the quality of the fresh fruity flavors so often sought in a good wine. And most feel that there is no value to decanting lower quality wines, younger white wines, rosé wines, or blush wines. Decanters are also used to remove sediment, which exists primarily in hearty red wines and is generally not present in white wines unless they are more mature, since sediment exists most often in older wines. As they age, the tannins, the acids, and the pigments of color start to separate and collect on the bottom of the bottle. Therefore, when decanting wine, the sediment can settle on the bottom of the Decanter allowing it to be kept separated from wine poured into another decanter or glass and not adversely affect the flavor of the wine being consumed. Older white wines are decanted to remove any sediment which exists in the form of clear crystals. Port wines have a sediment referred to as "crust" which forms and can be removed with a Decanter. The decanting vessel may be quite elegant in appearance or designed simply for utility purposes. Some have a traditional vertical shape such as carafe, while others are designed with sleek sloping lines that flow downward to a broad base. The Decanters with the wider base are quite popular for allowing the wine to be dispersed fully in order to effectively aerate both young and older wines for improved flavor and aroma. 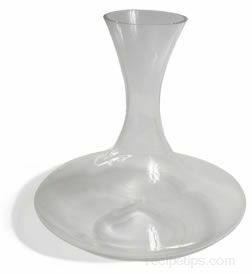 However, some versions of Decanters with wide bases have a tendency to spill contents as wine is being poured. Older Decanters may be made with glass that contains lead, while newer versions are lead free. If there is a concern regarding the lead content, check with the supplier or manufacturer to determine the components existing in the glass Decanter.